It's been nice being home for so many months, I'm happy to say that Ikebe Shakedown and Breakdown Brass singles are on the way. I've had some fun gigs (Ikebe Shakedown's tour, sitting in with Galactic, recording for Ghostface Killah's upcoming album, a demo for The Devil Makes Three, tons of deep reggae recordings with Clive Chin, Prince Polo, etc.) That said, it's time to head back out with Streetlight Manifesto! 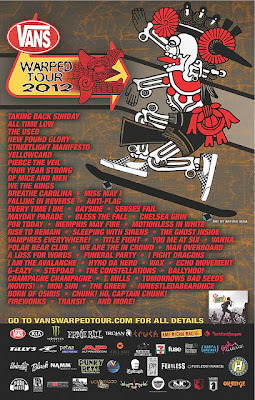 We'll be doing the entire Warped Tour this summer, playing on the Main Stage. Sweet? You can see the individual dates on my calendar. I'll be offering Trombone/Tuba/Improvisation/Arranging lessons every day at Warped Tour through BandHappy.com, so I'm looking forward to meeting some young musicians and hanging! The other Streetlight dudes are teaching as well, I highly recommend Chris Thatcher, Pete McCullough, Matt Stewart, Mike Brown and Jim Conti as excellent musicians and experienced teachers.